To most people who visit, Leavenworth is a quirky tourist town designed to make you feel as if you have been transported to Bavaria. But if you’re a boulderer, trad climber, or sport climber with a penchant for granite, Leavenworth has so much more on the table than just beer and brats. Leavenworth’s climbing falls into two main areas – Icicle and Tumwater Canyons – each with several sub-areas that offer plenty of options for both roped and unroped routes. For a long while, the area was best known for it’s multi-pitch traditional climbs, like Midway (5.5) at Tumwater Canyon’s Castle Rock. That route’s first ascent, by local legends Fred Becky, Wes Grand, and Jack Schwablad in 1948, is what kicked off the development of climbing here. Despite the Midway’s mellow grade, the step-across that begins pitch two has left many new tradsters quaking in their rubber shoes. But if you’re an experience trad climber who is looking for something a little more, the six-pitch Outer Space (5.9), at Icicle Creek’s Snow Creek Wall, is the area’s most popular test piece. Just keep in mind that this is old-school 5.9 – if you’re using the difficulty of your local gym’s top-ropes as your metric, this isn’t the climb for you). The highest concentration of bolted climbs is found at Clem’s Holler, in Tumwater Canyon. A lot of these routes, which range from 5.7 to 5.12, require supplemental gear, but there are still many good options of pure sport climbs. The best guidebook for Leavenworth’s roped climbs is Victor Kramar’s Leavenworth Rock. In more recent years, however, the truly exciting development around Leavenworth has taken place in the boulder fields. From the late ‘90s to early aughts, a crew that included Kelly Sheridan, Cole Allen, and Johnny Goicoechea began to obsessively explore the seemingly infinite chunks of rock that lay throughout Icicle and Tumwater Canyons. They established many of the most popular problems out there today. Sheridan’s book Central Washington Bouldering, is currently the definitive guide. The book covers other destinations as well, such as Gold Bar. However, so many new bouldering problems have been established even since then that Sheridan saw the need for an updated version. His new book, which solely covers Leavenworth, is expected to come out soon. Check his website for more information. 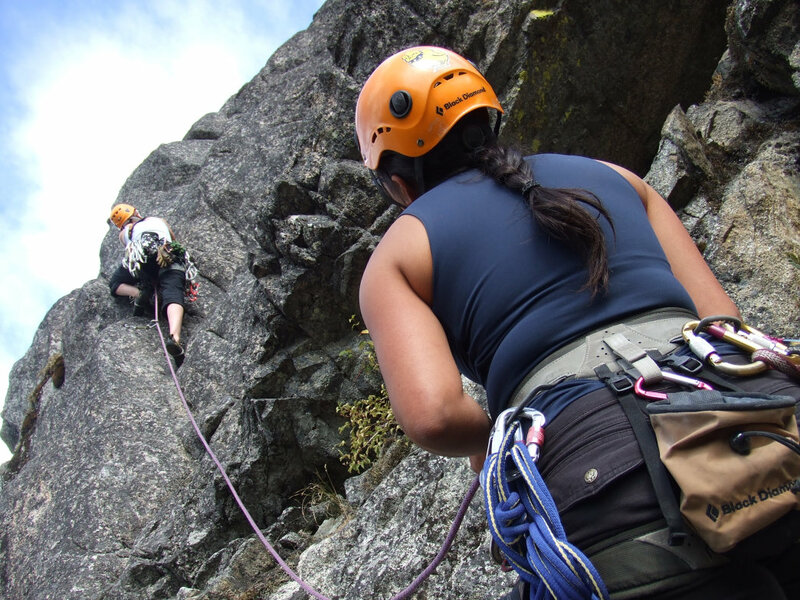 There’s enough climbing at Leavenworth to keep you entertained for weeks, if not years (in fact, in recent years more people are moving to Leavenworth in order to take better advantage of this hot spot of climbing). Roped climbers will get a kick out of doing climbs that have already stood the test of time, while boulderers can tap into the excitement of playing in an area that is still on the up and coming. Where to park depends on where you want to climb; there are several pullouts, mostly along Highway two. Consult a guidebook before heading out.